Biomass boiler specialist Wood Energy is celebrating continued UK business growth with the launch of a national Registered Installer Network. Wood Energy’s Registered Installer Network will provide highly skilled and trained biomass boiler engineers across the UK. This nationwide network of installers will receive expert training from the company to support its expanding customer base in the commercial and industrial sector. Wood Energy is a leading supplier of high efficiency renewable heating systems, including state-of-the-art wood chip and wood pellet boilers. The company provides design, installation and maintenance expertise for automatic wood-fuelled heating systems in varied applications, including offices, schools, hospitals and industrial processes. 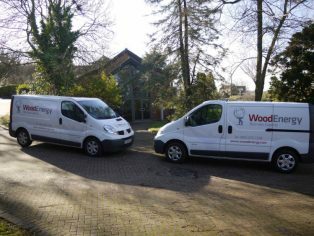 The introduction of Wood Energy’s Registered Installer Network coincides with the unveiling of a striking new brand identity and the launch of a new company website. The firm has also relocated to new headquarters in Bristol following its recent business expansion. Established in 2001, Wood Energy has over 450 projects in its UK portfolio to date. The firm’s team of highly skilled engineers has successfully installed over 100MW of renewable heating. Wood Energy’s clients include large blue-chip companies, public sector organisations, renowned architects and leading construction firms. Biomass heating systems enable operators to reduce dependency on fossil fuels, save money on energy bills and cut carbon emissions. Biomass boilers can operate as a stand-alone unit to replace fossil fuel powered systems. They can also run in conjunction with gas, oil or LPG heating systems. Wood Energy supplies the UK non-domestic market with automatic wood-fuelled heating systems that are highly efficient, reliable and user-friendly. The firm is the exclusive UK & Ireland distributor for Hargassner, and has held the Binder agency for 10 years; both leading European manufacturers of biomass boilers for over 20 years. Wood Energy biomass boiler systems can provide up to 10MW of power generation for heat, hot water and steam. The company offers a complete service including system design, installation, commissioning and lifelong maintenance to optimise performance.